BUCKFAST, England (CNS) — The hair shirt worn by St. Thomas More as he contemplated a martyr’s death in the Tower of London has been enshrined for public veneration. The folded garment made from goat’s hair was encased above an altar in Buckfast Abbey, a Benedictine monastery in southwest England. St. Thomas, a former lord chancellor of England, wore the shirt while he was incarcerated in the Bell Tower of the Tower of London while awaiting execution for opposing the Protestant reforms of King Henry VIII. Benedictine Abbot David Charlesworth told Catholic News Service Nov. 21 that the shirt had not been shown in public before. He said that although the shirt was a secondary relic, he believed it was of greater significance than a body part, or primary relic, because it was directly linked to the religious convictions of the saint. Abbot Charlesworth said St. Thomas was a man of conscience who was “standing up for freedom” against a tyranny that was trying to dictate to people what they could or could not think. Bishop Mark O’Toole of Plymouth, the diocese in which Buckfast is situated, said he hoped the shrine would become an international pilgrimage destination. He said there was a huge cult dedicated to St. Thomas in countries as diverse as Germany and South Korea. The bishop noted that St. Thomas also had global significance as the patron of statesmen and politicians, a title bestowed on him by St. John Paul II in 2000, as well as patron saint of lawyers. St. Thomas is recorded as wearing a hair shirt when he was testing a possible vocation to the monastic life at the London Charterhouse, a Carthusian monastery, when he was in his early 20s. The rough uncomfortable cloth is meant to encourage self-control, to serve as a penance for past sins and to unite the wearer with the passion of Christ. Although St. Thomas went on to marry and father four children, he continued to wear the shirt in private, sometimes beneath his robes of high office. He gave up public office when King Henry asserted supremacy over the church in England so he could annul his marriage to Queen Catherine of Aragon and wed Anne Boleyn, his mistress. St. Thomas was condemned for high treason after he refused to take an oath attached to the Act of Succession, which recognized any children of the marriage of Henry and Anne to be rightful heirs to the throne. The day before his execution, the saint gave his hair shirt to Margaret Giggs, his adopted daughter, and it remained in her family until 1626, when it was bequeathed to a community of exiled English Augustinian nuns in Louvain, Belgium. The nuns later relocated to Devon and, when their priory closed in 1983, they handed the shirt to the Diocese of Plymouth. In 2011, now-retired Bishop Christopher Budd of Plymouth asked the monks of Buckfast to put the shirt on display so it could be venerated by the public. 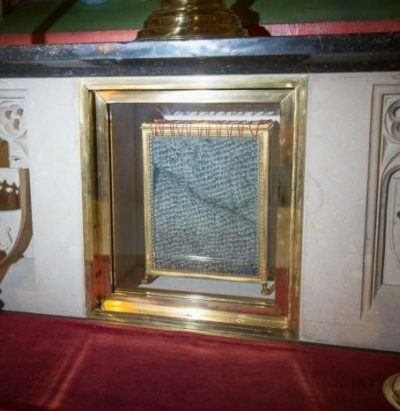 In October, the shirt was placed in a sealed case in a side chapel in the abbey church.